Frankfurt 2009: Mercedes SLS AMG | What Car? 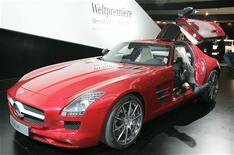 Mercedes-Benz has pulled the covers off its stunning SLS AMG supercar. Although its gullwing doors and bonnet vents are reminiscent of the iconic 300 SL, Mercedes says the SLS AMG looks to the future and not the past. 'The new SLS is a harbinger of the design philosophy of future Mercedes-Benz sports cars,' said Volker Mornhinweg, head of Mercedes-AMG. A 563bhp 6.3-litre V8 engine sits under the bonnet, paired with a seven-speed, semi-automatic gearbox. It can accelerate from 0-62mph in just 3.8 seconds. The top speed is limited to 197mph. The chassis and body are made out of aluminium and the car weighs just 1620k kilos, which helps it achieve such impressive performance figures. Fuel consumption not the most important stat for a car like this is 21.4mpg. Mercedes says the car's styling is influenced by aircraft design. The cone profile of the star on the grille and the air vents in the dashboard are said to look like jet engines. The cabin resembles a cockpit and the gearlever looks like the thrust regulator in a jet fighter. The car's sporty stance is created with the help of a bonnet that's almost two metres long, and with 19-inch wheels on the front and 20-inchers at the rear. There's a small spoiler integrated into the boot that extends automatically at 75mph. The gullwing doors not only look cool, they actually make getting in and out of the low-set car easier. Thanks to gas dampers, they are also easy to open and close. The car will go on sale in the UK next summer, but prices won't be confirmed until early 2010.